If what happened in Vegas last night, stays in Vegas, we are NOT going to be okay with that. 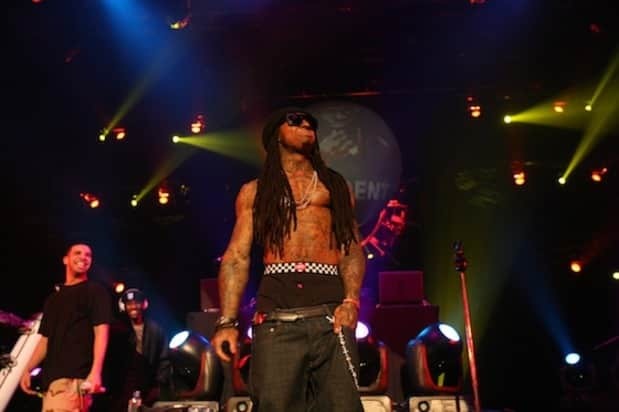 Lil Wayne jumped onstage during Drake's final tour stop at the Hard Rock Hotel to perform "Miss Me," and judging from the videos, those in attendance enjoyed it quite a bit and jumped around a little. According to Karen Civil, Baby, Lloyd and Tyga were also in attendance, which you can see when Drake runs over to spazz out with them during Wayne's verse. We now expect to see Wayne on the next G.O.O.D. Friday track, Meet The Press, Monday Night Football, the G8 Summit and about a thousand other mixtape tracks in the next few weeks. Hope all other rappers enjoyed the spotlight for awhile. See a lot more photos over at All Things Fresh and the videos from backstage and front row after the jump.